As is usually the custom, once we reach this point of the year, we tend to review the things we did during the year. Some people look back to see if they’ve accomplished any of the goals that they’ve set for themselves. Some look back in regret. Some people look back to learn from mistakes. Some, like me, do a combination of them. I am not big on self-promotion. Call me shy. So I’ve never looked for accomplishments. I often review with a combination of regret and what did I learn. In January, I learned of a cool little indie museum called Empire Seven Studios in San Jose. My friend Kyle had a show there. I loved that his pieces were filled with whimsy. The volume of pieces that were up in the studio was insane. There had to have been easily over a hundred of them. I scored two works and love them both. The one that is officially mine looks like a bunch of tiny blotches that look like a body with arms and legs painted in. The way that it’s done makes it look like it’s a dancer. The other belongs to Perry and it looks like it could have been part of a Dr. Seuss story if you aren’t close enough. I regret not being able to by more of these cool works. What I love about Empire Seven is that there isn’t any pretense. As you can see, the walls are decorated (I don’t know for certain if it’s by the Artists or not, but I think it is.) and it reminds me of how I decorated my first apartments. When I walk into other museums, the stark white walls just seem so authoritative. I know it’s so you can focus on the art, but I feel like I am supposed to behave as though I am in a library with whispered tones and a look that says ” I am deep in thought”on my face. This place says, come and check out what some local people have created or just come and chat with some cool cats. The cast of "Bless Me. 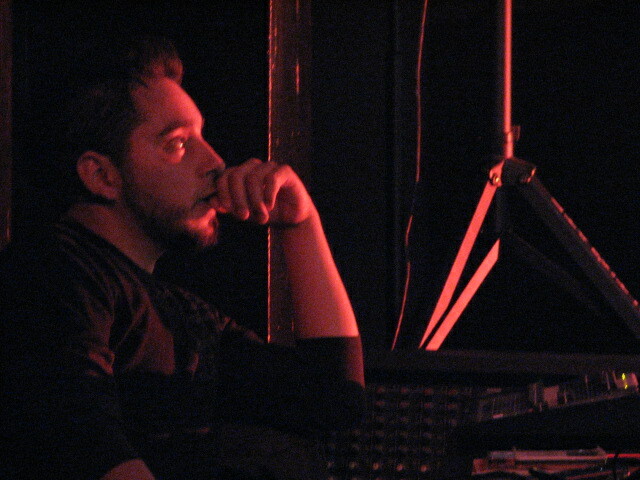 Ultima"
In February, I began working on my second project with Teatro Vision. It’s a wonderful company, and it provided me with a nice change of pace from musicals or comedies. My love of this company is so much more profound than I remember from my first experience with them. I learned to not only question everything, including my beliefs (are they really mine or what I was taught?) and ask questions. Through them, whether by osmosis or a new habit, I became more informed about the events of the world. That is something that isn’t really talked about in American news. To pay attention to all the things that are happening in the world, not just what the big cable networks are telling you is news. Find independent sources of news like KPFA which has MANY links from which to check out. This second time around, made me feel more connected with my heritage. I know it sounds like I am being outrageous for the sake of it, but let me clarify. Even after working on “Hero” with Teatro, I was still too self conscious to speak Spanish words. I remember having to learn some Spanish in 1st grade and some of the kids would make fun of us on the playground. I don’t even know why I was in that class. I spoke perfectly fluent English with complex sentences. Maybe it was the brown skin. So, I have made it a point for myself to not be what people believe I am. 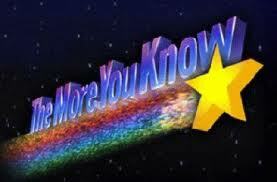 I didn’t bother learning any more Spanish after that school year, and in high school I learned French. With this cast being 3 times bigger than my first experience, I was surrounded by all these wonderful amazing incredible people that were an honor to work with. And I began to learn some Spanish. Little by little, I hear a word here and there and I try to remember what it means. But merely speaking a language isn’t all that I am talking about. I am finally beginning to see the beauty in the culture itself and learning about it’s past. In March, I decided that I was going to join the AIDS Lifecycle. On a whim, I decided this. So when I look into the details, I find that registration has been closed for like 2 months! I was a little disheartened, but then I figured, well, hell. I can ride next year! So I requested to be added to their early registration alert. So any day now, I will be expecting an email saying it’s time to sign up. So while I may regret not being able to ride last year, I am hoping that I get everything ready and train for it this year! Also in March, we celebrated our 15 year anniversary! There were no bells. There were no drinks. There was only, wake up and go to work to pay taxes and rent and bills. And there still are no Equal Rights…. I didn’t have too many things to regret the first part of the year, thankfully. Well, kids, Quarter #1 is over. What did you learn during the first three months of 2011? More importantly, what do you regret and how will you make sure not to repeat it in 2012? Comments are always welcome. 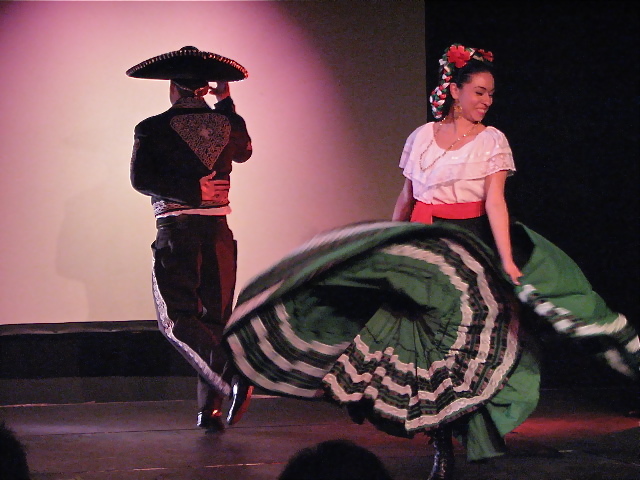 Friday night, Teatro Vision held a little fundraiser to help cover the cost of sending two Teatro Vision representatives to the National Theater Communications Group Conference. Typically, this conference is held in the East Coast, but this year, it’s happening in the City of Angeles. The TCG is focused on how to keep the Arts alive and changing with the times. On their site, they say that the theme of the conference is “What if…” I think it’s a brilliant theme and I loved some of the questions they posed on the page. You should check it out! How could I not want to help a local company, that has given me so many opportunities, travel to something this important? With this in mind, I accepted the invitation to the get together and was granted permission by Elisa to take photographs of the night. Since I didn’t want to distract the performers, I didn’t use the flash, so there is a kind of 70’s looking graininess to them that I kind of like. But I really did want some clear shots especially for the dancers. The night’s hosts Rodrigo and Elisa made everyone feel welcome and thanked the crowd many times over. Rodrigo was the emcee and he was incredibly charming behind the mic. He spoke of the hope that this event may be something that Teatro will host every few months to have a chance to reconnect with each other. It was a small gathering, but he said we were all familia. That’s one of the great things about Teatro Vision that keeps me wanting to go back again and again. First up to perform was Cristal Gonzalez. 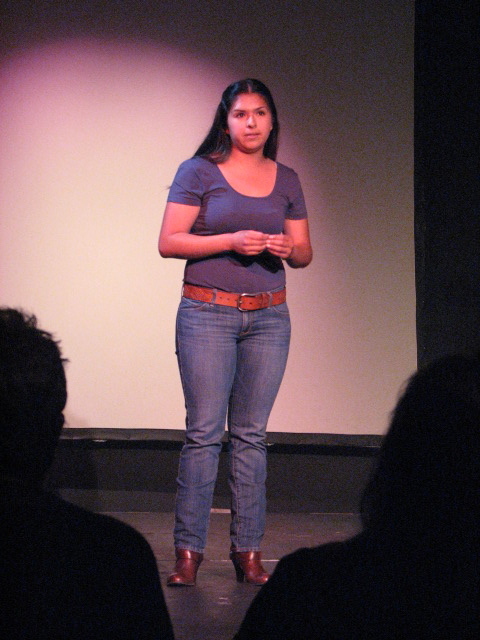 She performed a monologue titled Hero & Saints. This multi-character scene began with an Erin Brockovich type reporter bringing to light the toxic water supply in a California city and the citizens struggle with governmental assistance. The reporter shifts into a gossipy neighbor, then into a mother and grandmother of a child dying from the water. It was a lovely piece that makes me want to know the rest of the story. Next up was Sarita Ocon. Sarita performed an original piece called “Compromise.” This performance was also uses a monologue from the play “References to Salvador Dali Make Me Hot.” While speaking with her, I found out that it’s an exaggeration on an experience that happened to her at an audition once. 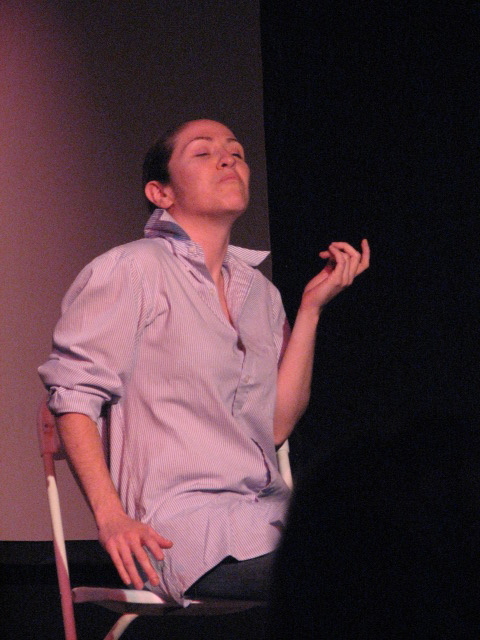 She slates as one would at any audition, then begins to launch into her monologue. She is repeatedly interrupted by the director who is constantly trying to make her more feminine or more “Latina” I cannot explain how fascinating this was to watch. I just knew that I was watching someone incredibly special. I mean, I have NEVER paid so much attention to how someone rolls up their sleeves. I was completely enthralled and did not ever want it to end. Her transformations were marvelous. You could see, after she was “directed,” she took time to change her attack and she showed you without a word and without making it a long drawn out thing. Not only was her performance mesmerizing, but her story was so full and complete that it wasn’t until after I got home that I realized the song that lead into her piece was a perfect choice. I don’t know if she requested to be brought onto the stage to the tune of “I’m Your Puppet” by James and Bobby Purify, but it fit with the idea that she had to do the things that the director wanted. By the time she was done, she was the complete opposite than what she started and was so much more intense that when she left the stage, the room exploded with applause. Truly an amazing and gifted artist, and I would LOVE to work with her. The next performer was a shock to me for two reasons. The first was that this is a Latino function and there’s so much machismo in this culture that I didn’t expect it. The second was the audience reaction. I feel bad because I couldn’t quite catch the name, but we were treated to a fun three song set of a drag performance. Her heels must have been at least 3.5 inches so I don’t know how she did all that she did in them. Props to her for that alone!! She worked the crowd and they loved it. I wish I could tell you the songs she used, but they were in spanish and I was just lost. So I focused on the beat and the dancing. She was all kindsa sassy! So fun though. 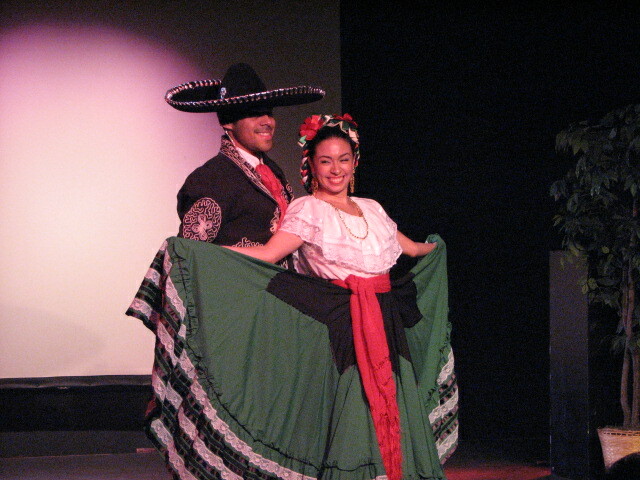 Closing out the show would be my first folklorico dances since I truly began to appreciate dance. My friend the beautiful Anees Guillen and her dance partner Alex Morales delighted the crowd with a three song set as well. It was stunning. I couldn’t help but to be drawn to the way she would work that dress!! It just moved to well. They had asked me to make these little calls or yelps to cheer them on, so when I tried it, I felt like I wasn’t doing it right. I didn’t do them very loud, but I tried. While it was the end of the performances, the night was still young, so I hung around and danced my first line dance! When I told Perry and one of my other friends this, their reaction was the same: Me: I danced my first line dance. Them: Ugh! Me: It was to Billy Ray Cyrus’ “Achy-Breaky Heart. Them: UUgh! Me: In Spanish. Them: UUUGH!! But it was super fun. I got a little sweaty thanks to the tunes of our playlist iDJ, Hugo, who was also very active in getting everyone into the line. I think in all there were four songs that had a line dance type of movement to them. In the MACLA gallery, I was greeted by the works of Elizabeth Gomez. She works with mixed media to create images of nature/animals that are adapting to human habitats mixed with religious iconography. One of my favorites called “Crow” is a large beautiful piece of blues with little faux flowers that looked to be painted to match the canvas settings. It’s a charming and lovely piece that would look perfect in my blues filled living room. One of her other pieces was of a mountain lion that had been shot by Animal Control, I believe it was. I don’t know if you remember the mountain lion that was found in the backyard of a Redwood City home and was shot rather than captured and released that happened a while back. Thanks to, for lack of a properly respectful term, Ms. Gomez’s love of nature, her sorrow for this pointless killing inspired her to create a stuffed toy replica of the lion and underneath is scarlet red fabric. There are three deep indentations with that same scarlet fabric sewn into them with ribbons of it flowing out the “wounds.” I am sure that my likemindedness regarding nature and destroying other creatures homes for humanity’s benefit allowed me to connect with this image and made me feel what I guess is the same sorrow that she felt. The hanging flowers over the body offer a touching element representing that love of nature. I was so caught up in looking at the lion and the other works that Ms. Gomez created that I didn’t even realize the doors opened and people were filing in. All in all, it was a wonderful night! I got to hang out with my buddies Hugo, Rodrigo, Anees, and Elisa. I got to meet some cool new people like Alex and Sarita. And I was blessed with inspiration. What more could I hope for? I TOTALLY love the cast of Bless Me, Ultima! Boy, oh boy, Saturday was a blast. The day started with a welcome by our director Ms. Elisa, then followed by the exciting news that Bless Me has actually just wrapped up filming as a feature length movie!! One element I am really impressed with is that there will be a massive attempt at using as much live music as possible. Hooray! I can’t seem to do a show without having to sing. Haha! 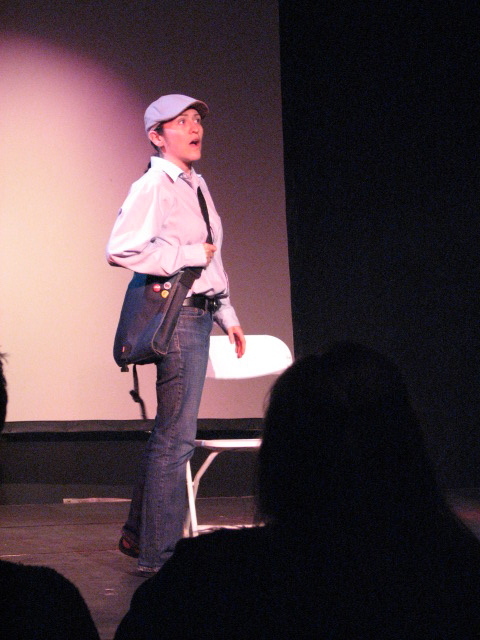 Even in the last play I did with Teatro, Hero, I sang the line: High School…High School Musical 2! After the presentations, we all introduced ourselves to each other. We took a short break, and then dug into the script. Things have been changed and reassignments were adjusted, and the train began to move forward. At first as we began to read, things felt a little tense to me. Not for any particular reason. It could be that sometimes it’s uncomfortable to read aloud. It could be that the cold in the room was a little distracting. It could be that some of the people were missing parts of their script. After we got about six scenes into the read thru, Elisa stopped us and asked about the themes that we’d come across so far and how we feel about them. People brought up religion, good v. evil, and duality just to name a few. Then it got a little weird. I understand what was meant, but I think it’s a bit trivial as far as the issue went. What happened was someone said they didn’t like the fact that the word “magic” was used to describe the things that Ultima could do. The reason was that the term “magic” made them think of pulling a rabbit out of a hat or something along that line, or that “magic” was only used for evil things. I am a little torn that there is talk about changing a word that is the supposed school of altering things either by supernatural means or through knowledge of natural laws unacknowledged by science. It goes back as far as alchemy does. Magic was used long before the likes of Harry Houdini and others had began to create tricks and illusions for entertainment. What I wonder about is was that something that offended the person who purposed the change due to their religious beliefs or was it because it truly reminded her of parlor tricks? If its the former, isn’t that why we are here to do this play? If it’s the latter, do we really have the power to change the words of the playwright if a wording change diminishes the power of the script? It also made me wonder why no one had problems says “miracles.” Aren’t those just magic? The difference that was told to me was that one is religious based while the other was more of a hedonist term. WTH? This lead me to believe that this group was more religious that I thought and that’s where the whole Magic debate stemmed from. That makes me a little sad. When I read the book, what I came away with is that you should question religion. It’s not something that is only contained inside of four walls. There’s a lot of back and forth for the main character, Tony, about the belief in the churchy god and the energy that’s everywhere that just is. That church god and cosmic energy are one and the same. It’s okay if you wanna believe in both! Now, I don’t mind either way what anyone believes. That’s what makes the word go ’round. However, with the church being all greedy and stuff, it acts like a child. If you were to compare the two, Magic is much older than most religions. Just sayin’! Churches say, you can’t do this or that. You can only worship in a confined space surrounded by others as witnesses to make sure you are doing what you’re supposed to. With the energy, there’s just possibility. There’s no one saying you can’t. You must follow your own moral compass and decide if what you do will hurt someone else. It was a great conversation, sometimes it did go off track, but THIS is why I love working with Teatro Vision. I don’t get anything like it with WVLO, or Sunnyvale Players, and Saratoga Drama Group. The people in this cast are all fun loving and easy to laugh with. It’s going to be a happy, happy experience working with these folks. Also, for those of you interested in another fellow theatre blogger, my cast mate Jess is the author behind Theatreg33k.blogspot.com. I am thinking a podcast with her will be a blast! I’ll keep you posted on that. Woo hoo!! The countdown to my first rehearsal for the next show has begun! Less than half a day to go and I have to say that I am very nearly biting my nails with nerves and excitement. 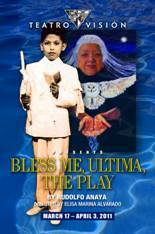 Orientation for Bless Me, Ultima with Teatro Vision will be held tomorrow. It’ll be great to finally get to meet everyone that is in the cast. A brief synopsis of the show is as follows: The Marez family is one full of conflicts. 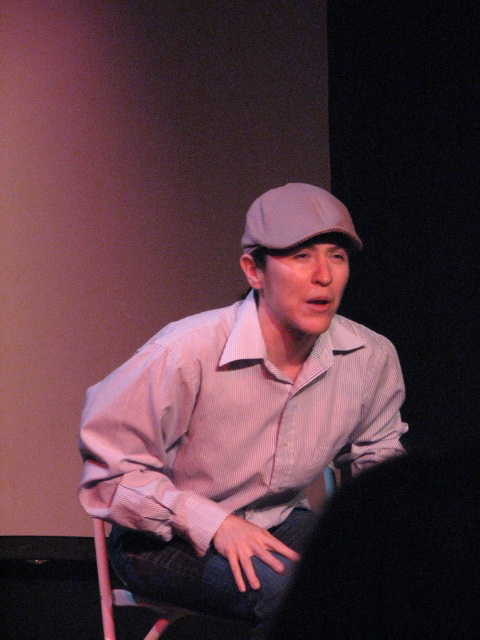 The central character of the play is the youngest son, Tony. His mother wants him to grow up to become a priest “which will bring honor to their family.” His father wants him to be a vaquero or cowboy because “his people are of the llano” and long to be out in the open. A friend of the family, Ultima, one day comes to live with the Marez family. Ultima is like a a female shaman; she uses herbs and natural ingredients to cure illness and even curses. Tony, who has been conditioned to believe that god is only found in church, becomes confused with knowledge that Ultima shares with him regarding what she’s able to do. One of the things that usually happen during the first rehearsal is a table read, or a read thru. Basically, everyone just sits and reads the script. It’s not exciting to describe, but as people settle in to the reading you get to hear the beginnings of the possibility that is held within. Sometimes, that simple exercise of the table read, creates a great bonding experience if the script is powerful enough. I’ve read the book and there are a lot of things that couldn’t be fit into the play. While reading the script, I sort of feel like the transitions between the scenes are a little abrupt. I will be eager to see what the lighting and scene design team are going to come up with. Something else that I want to accomplish tomorrow is to set a time for an interview with the director of the play. 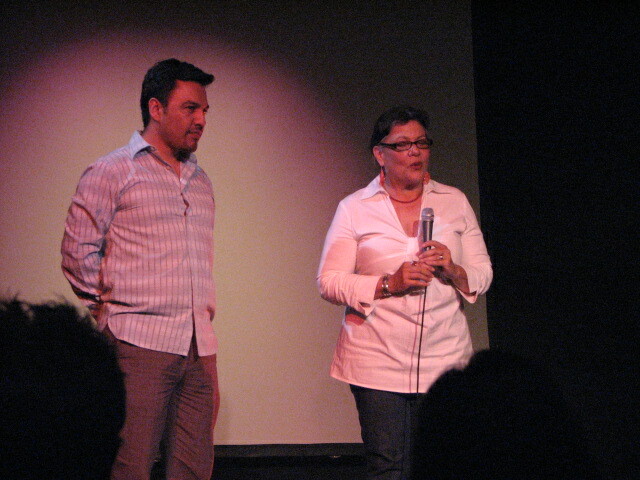 I hope to talk to her about not only the play but also Teatro Vision and her experience in theatre. Maybe I’ll be able to get her to help me score an interview with the playwright. I am so excited for this next project, and I will keep you posted. 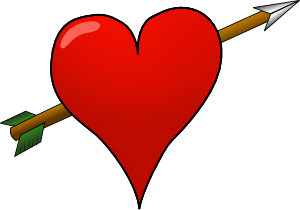 I talk about death threats, the joys and un-joys(?) of being in a show, and of course music from the Podsafe Music Network. Show notes to follow Saturday morning.